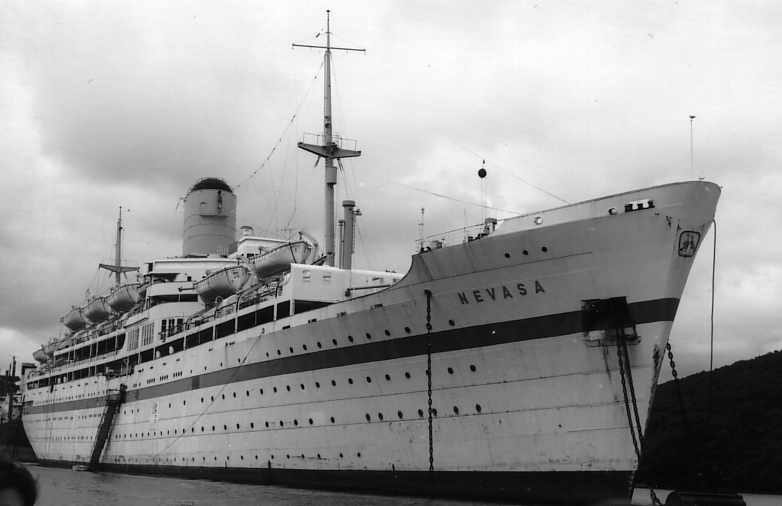 The third Nevasa was built for BI in 1956 as a troopship under government specifications. She was followed by her near sister, the Oxfordshire, built for the Bibby Line in 1957. These two ships were the largest troopships built in the UK and set new standards for the comfort of their passengers. HMT Nevasa at Valletta with an aircraft carrier in the foreground. 4th March 1960. Source: Michael Cassar. Unfortunately both ships' careers as troopships were cut short as the result of the government's termination of national service and the increasing transfer of troops by air. In October 1962 Nevasa was laid up in the River Fal while BI management decided what to do with their troopship that was only 6 years old. HMT Nevasa laid up in the River Fal prior to her conversion to an educational cruise ship. She was positioned just south of the King Harry Ferry, less than half a mile from where the SS Uganda would be laid up in 1985/6. Source: © John Clarkson. Eventually BI took the decision to convert Nevasa for a new role as an educational cruise ship. 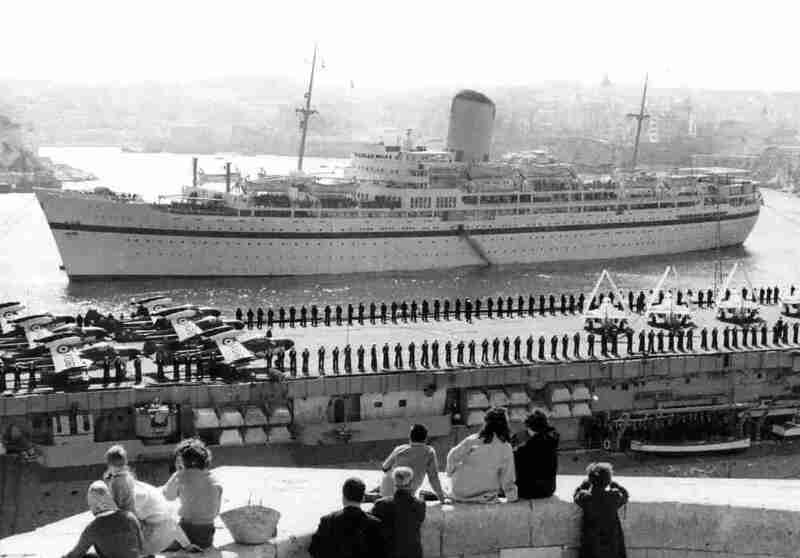 The conversion was carried out in Falmouth and in 1965 Nevasa commenced cruising alongside Dunera and Devonia, both already operating as successful school ships. However the two D class ships were nearing the ends of their lives and were replaced by Uganda in 1968. For the next 6 years Nevasa and Uganda each provided over 20 cruises annually. Most cruises were fully booked, carrying 900 to 1,000 British schoolchildren to ports around Europe. However a few cruises carried overseas passengers, most notably a number of Canadian parties. Educational cruise ship SS Nevasa, as many dormitory and cabin passengers from 1965 to 1974 will recognise her. Source: P&O Collection. Fuel prices increased sharply in 1973/4 and Nevasa, with more powerful machinery as a former troopship proved less efficient than Uganda, so her career was once again cut short. Following her Christmas cruise in 1974, Nevasa was sent to Taiwan in 1975 for breaking up.